So picture this: I’m broke, standing in the Buckingham Palace gift pavilion and looking for a present for my husband. I’m broke because I’m a novelist, at the Palace because I’ve just had a curator tour of the Royal Gifts Exhibition in the State Rooms, and looking for a present for Ned out of guilt, because while he’s slaving away at his desk, the Queen just gave me a cake. Ok, what I mean by that is one of the nice PR people from the palace gave me a café voucher for a pastry, but it was a very fine millefeuille which is Ned’s favourite and had a crown on it, so it counts. The Queen gave me a cake. I don’t think I’m going to top it today, but the best present I’ve ever given my husband is a black glazed terracotta dipping cup, made in Apulia around 300 BCE. We fill it with terrifying spirits and pass it round the table at the end of dinner parties. It’s beautiful, but very simple, valuable, but no so valuable we have to lock it away. What makes it special is its age. It was there being a cup doing cuppy things when Christ was born, when the Vikings sacked Lindisfarne, when Caxton set up the first printing press in London and when the internet blinked into life. To Ned and me it symbolises hospitality, simplicity, change and continuity. It’s a sign of shared values. It says I know you, and you and I think the same things are important. Sometimes a cup is not just a cup. We all assign value to objects through an uneasy and shifting dialogue between prevalent cultural values and our individual and shared histories. As a result gifts are never just themselves, they are a bundle of associations, allusions and suggestions. They say this is what I think about you, and often, this is what I want you to think about me. A gift is a message. Which is probably why I normally exchange strong drink with most of my writer friends and my mother often gives me cleaning products. With this is mind, looking at the gifts given to the Queen over the course of her long reign and from all over the world provides a fascinating series of snapshots of the relationships between nations and peoples and I found a huge amount to enjoy in the eclectic mix of items on display. 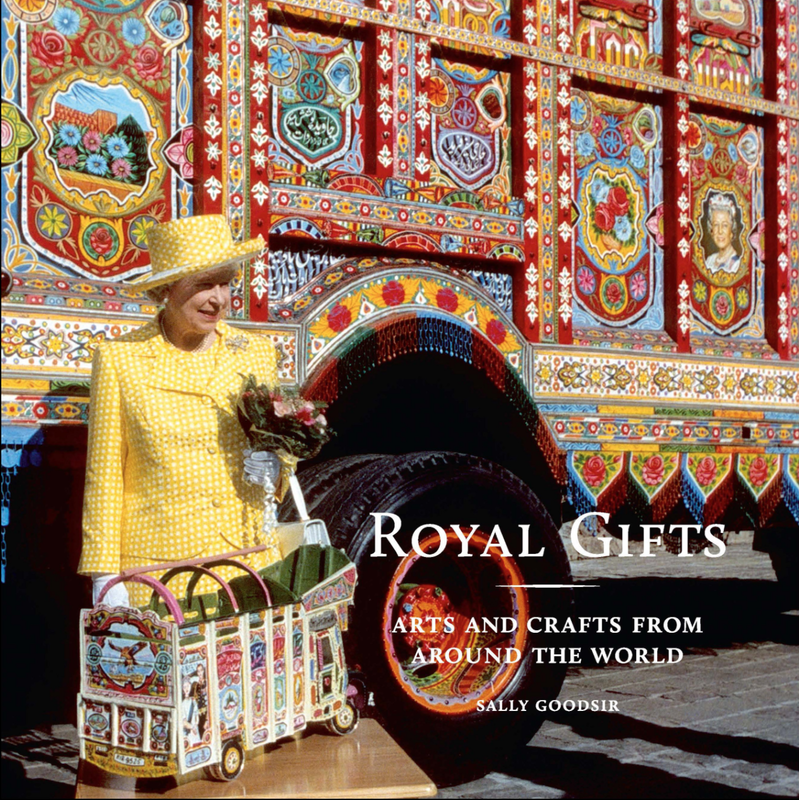 They are grouped geographically by the giver, and there’s also a section devoted to gifts from the UK. 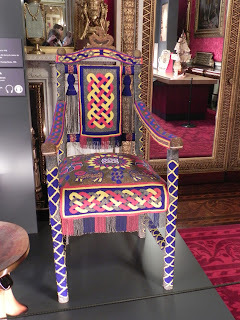 A lot of the gifts are exemplars of local arts and crafts, such as the magnificent beaded throne given by Nigeria and made by the Yoruba people. The throne was one of my favourite pieces in the exhibition. 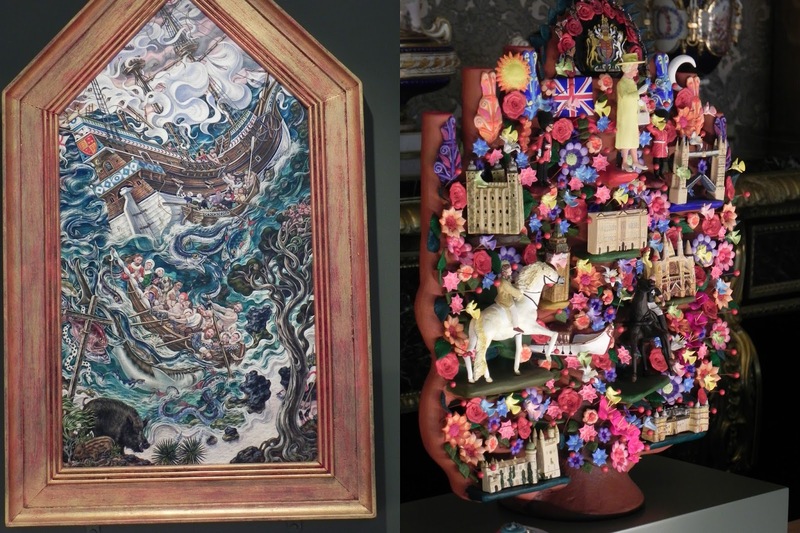 It's strangely lovely, such skilled work and full of its own particular symbolism. From Bermuda comes a oil painting by Graham Foster of the wreck of the Sea Venture in 1609. Everyone survived the wreck, so it's not commemorating a tragedy, but evoking a shared maritime history. The Mexican tree of life is the product of different cultural cross-currents and also an affectionate portrait of the Queen herself, who features in a natty yellow ensemble in the centre of it. 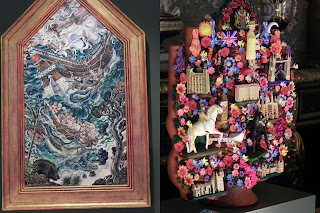 Some gifts are startling in their simplicity, such as the prayer shawl blessed by the Dali Lama from Tibet, others seem rather driven by affection such as the map of New Zealand presented by their girl guides, with an accompanying book signed by every girl guide in the country. There are also some unconventional treasures on show whose values are rather like that of the relics exchanged between medieval monarchs. A bone is just a bone, but when its the thigh bone of a saint it’s a worthy gift. A scrap of cloth is not valuable in itself, but when it is the Union Flag badge worn in space by Major Tim Peake it becomes something fitting to give to a monarch whose reign began before we’d climbed Everest. Of course, I am, as all the visitors are, also bringing my own ideas of meaning to these gifts, but that is the pleasure of these objects, they are extra chips of glass in the historical kaleidoscope and seeing them together is a fascinating way to shake up and reexamine what we are trying to say to each other. The exhibition is perhaps overshadowed by the State Rooms themselves, but then I doubt many people would pay £23 entry fee just to see the gifts. 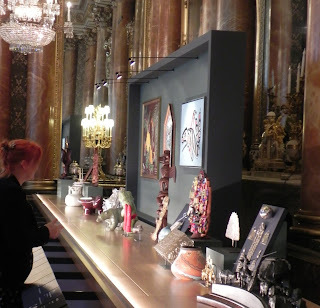 I've never been to this part of the Palace before, so was distracted by the Vermeer and Van Dykes, the chandeliers and thrones, not to mention the 1980s gas fires in the ornate marble fireplaces. The gifts do make for a very interesting addition to the tour though, and the setting only emphasises the variety and varied aesthetic pleasures of the gifts displayed. So what did I get Ned? Well it had to be relatively cheap, and fun, but I didn’t think he’d really appreciate a stuffed Corgi. I wanted something Royal, but something about us too, so I got him this. He says he likes it. That's a sensible sort of gift. You can use it. 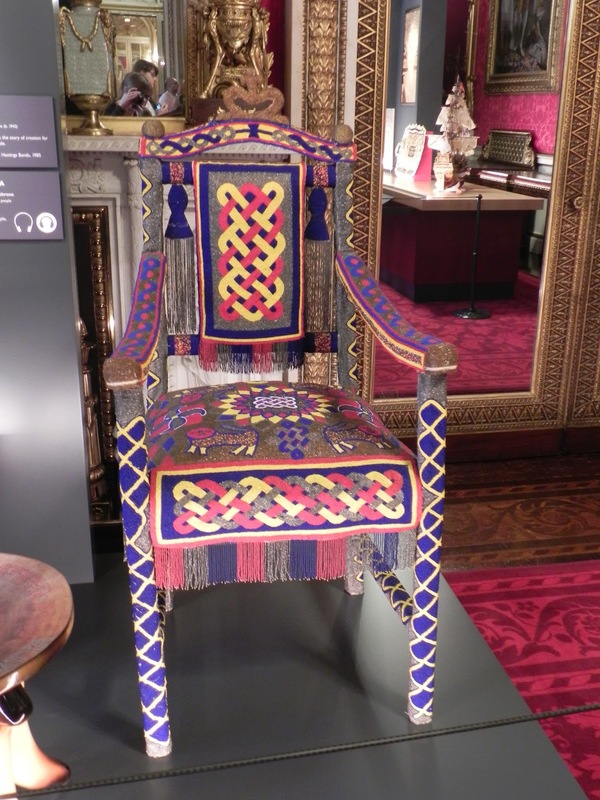 I always feel sorry the Queen cannot actually use the things she is given because some of them, like the beaded throne, are intended to be used. It's all very grand in those public parts. I was once (long story) given a quick glimpse of a small part of the non-public part and it isn't nearly so grand!